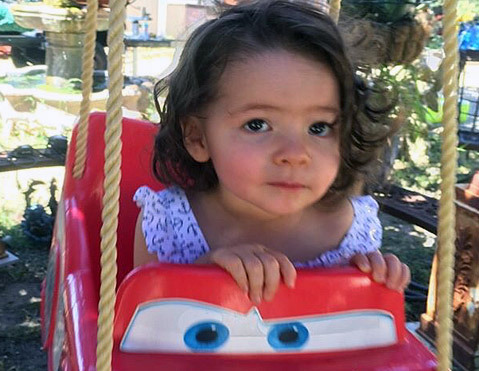 This Saturday, two Santa Barbara Sheriff’s deputies helped save an 18-month-old girl found choking on the Chumash Reservation. At around 2 p.m., Deputies Brian Flick and Jorden Walker were responding to an unrelated call at a home in the 100 block of Sanja Cota when a neighbor, Amber Cota, came running outside screaming for help and holding her daughter, Lah’nee (Lah-nay) Cota. Lah’nee was choking, unresponsive, and turning purple, said Sheriff’s spokesperson Kelly Hoover. Flick and Walker immediately took Lah’nee and tried to dislodge any items that may have been blocking her airway. The two deputies tried a series of “back blows” — smacks between the shoulder blades of a choking person — followed by the Heimlich maneuver and a finger sweep to ensure her airway was clear. About 30 seconds later, said Hoover, Lah’nee was able to breathe on her own, and the deputies stayed with her and her mother until paramedics arrived. Lah’nee was transported to a local hospital for further evaluation and has since made a full recovery. In January 2015, a new Sheriff’s substation opened on the Chumash Reservation, Hoover noted. The department says the substation allows for faster response times on the reservation and throughout the Santa Ynez Valley.